Pecard & Kiwi available soon! So I have decided to put my money where my mouth is. 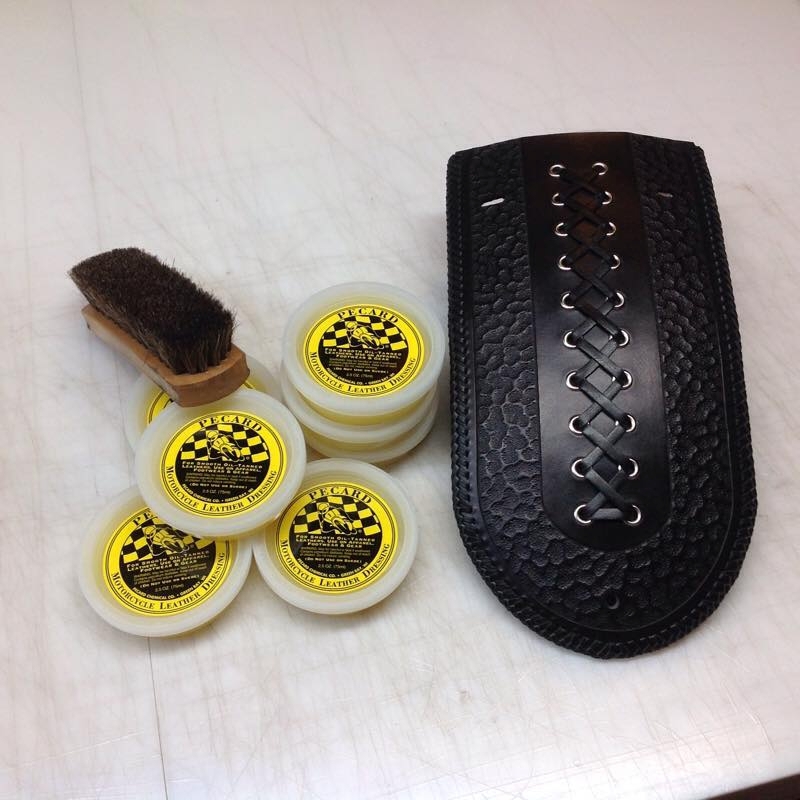 Starting today I will be carrying Pecard Motorcycle Leather Dressing and Kiwi Horsehair brushes for purchase. I talk about them here and Facebook/Instagram but then send folks elsewhere to buy it…not anymore. I’m also going to offer them at the same price as Pecard, no unnecessary gouging here. Prices will be $4.00 for a 2.5 oz jar of Pecard Motorycle Leather Dressing and $6 for a Kiwi Horsehair Brush. Shipping for one or both is $5.25 via Priority Mail (USA/APO addresses). Order them with your custom leather job and they’ll be included in the same box to save on shipping. The new website should be online later this month with the new products. 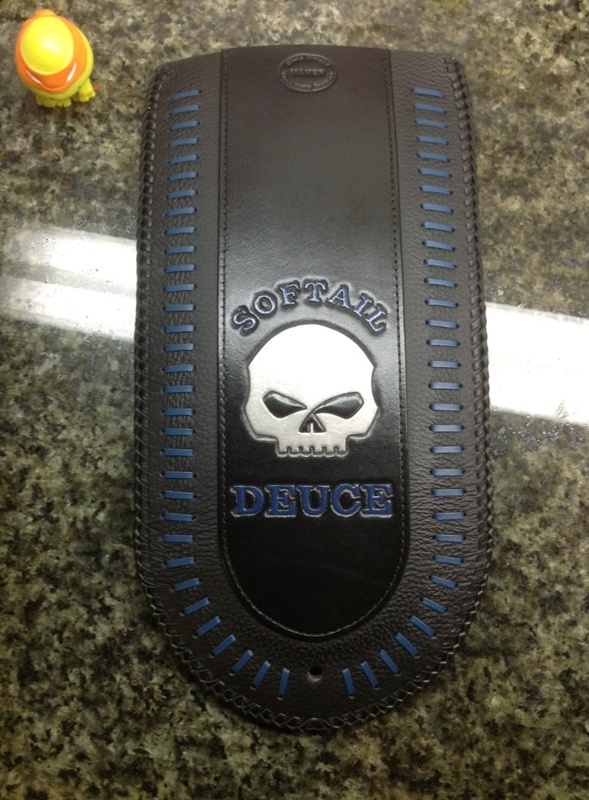 In the meantime drop me an email at chris@threemuttscustoms.com to order or request it with a custom leather job. New artwork option – Laser Engraving! I’ve been working on a few different options for custom fender bib and tank bib artwork to compliment hand tooled designs for the last year. After researching what is possible, what looks best and performs under the sometimes brutal conditions motorcycle leather can go through I added custom embroidery to the line up late last year. Embroidery gave folks another option for affordable, full color designs but there was still a gap in the line up. I wanted another line, one that could provide in stock or fast ship inventory at a great price and still be somewhat customizable. I was also trying to figure out a way to provide bibs with the possibility of tiny detail, to the level that hand tooling and embroidery couldn’t achieve with prefect clarity. 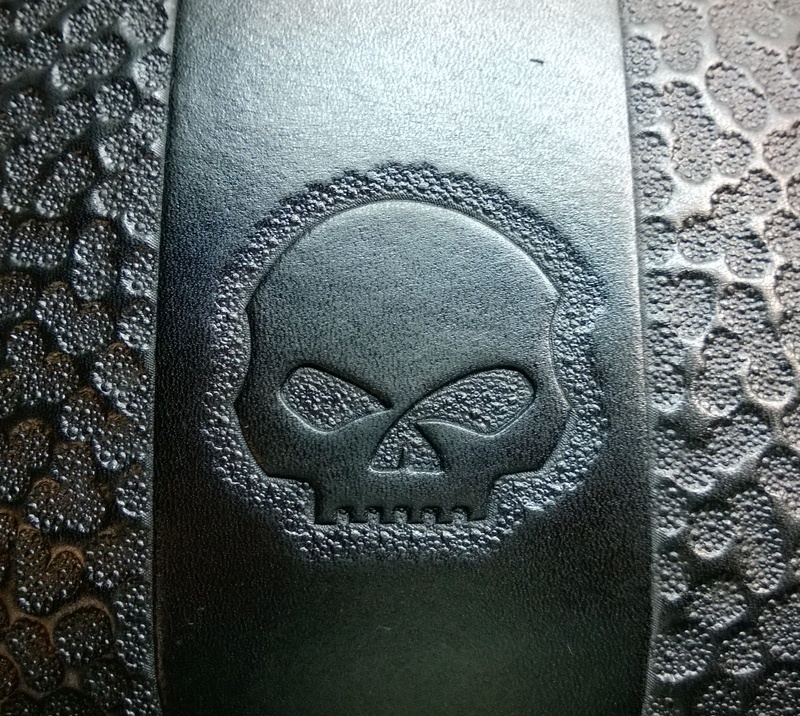 After long consideration, I’m adding LASER ENGRAVING to the available options for adding designs to your custom leather fender bibs and tank bibs! Laser engraving is a great addition to our offerings, the detail possible is insanely small and it has a similar appearance to hand tooled artwork for flat two dimensional and line art designs. It will also allow us to now personalize items like the wallet chain and key chain fobs like never berfore. Here are a few examples of pieces a few clients have been brave enough to let me experiment with to dial in the process, enjoy! New Softail hybrid tank bib design! Normally new work goes into one big post but this being a new style of Harley tank bib designed by yours truly, it deserves a bit of extra attention. I’ve noticed over the years that Harley tank bib styles are pretty much the same across the board but certain models had room for improvement. Specifically, those Harleys with the spring seats like the Softail Deluxe where the seat leaves a portion of the frame backbone visible between the tank and seat. While the standard rectangle tank bib hides the backbone just fine, there was room for improvement and accenting this area with a bit more style. I’m pleased to introduce the new Three Mutts Customs Harley “fishtail” tank bib! The top of the bib mates with the speedo bezel flush like usual but the bottom cuts in to fit the lower tank cut out before flaring out again into a tail section that is formed to cover the top AND sides of the exposed backbone. 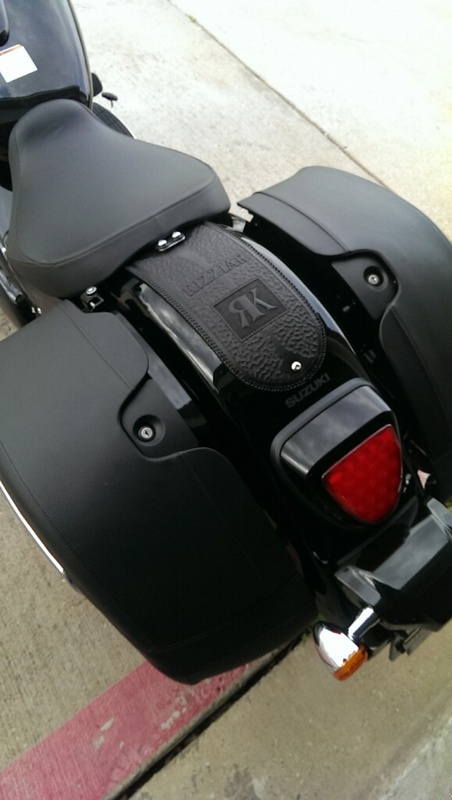 Hand braided edges or edge piping is included in the base model, including the fat 1/4″ edge piping that matches the black & white diamond stitched seats available from Harley. 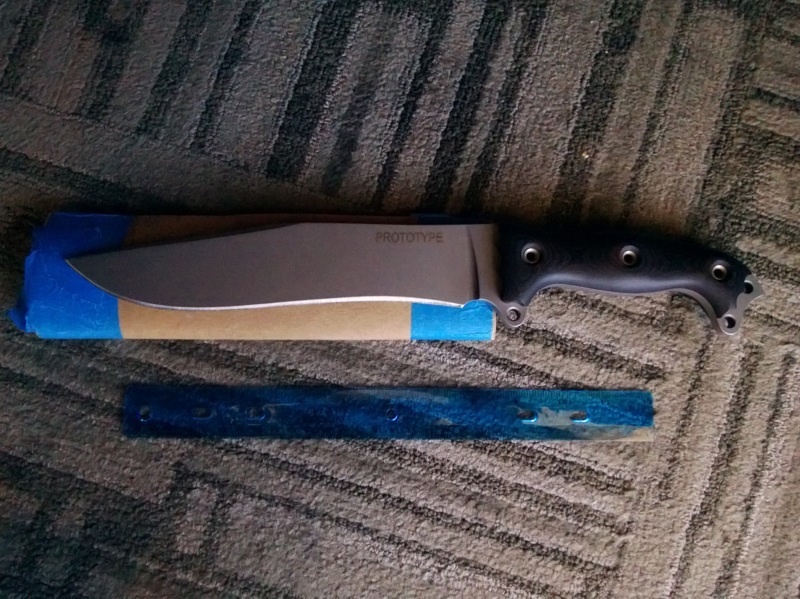 Here are a few pictures of the new design. Our gorgeous model, showing off her new leather top is Gary’s 2012 Harley-Davidson Softail Deluxe. The attention to detail on this bike is awesome; along with the custom tank bib, it sports custom covers, flushed caps on the gas tank, true duals leading to hand twisted pipes and fishtail exhaust tips and more…doesn’t get much nicer than this! I’ve been working out the details on a new coloring process called “Black Antique” to help highlight darker bibs with extensive tooling. The product isn’t new but the way I use it is and it took a bit o playing around to figure out how to do it right. Why? Because solid black bibs look cool but when crazy detailed toolings are dyed all black, they loose a bit of that detail due to the loss of defining lines and shadows. The best way to describe Black Antique is it gives the tooling a burnt look, maintaining the dark colors while letting the detail show through. In direct sunlight, the artwork pops a little more, showing off areas where the color has been pulled back to look, well…antique, aged. Here are a few examples of the new Black Antique coloring results on some recent Harley rear fender bibs and a Harley tank bib. For those interested, the previous post shows these pieces in their raw uncolored state. 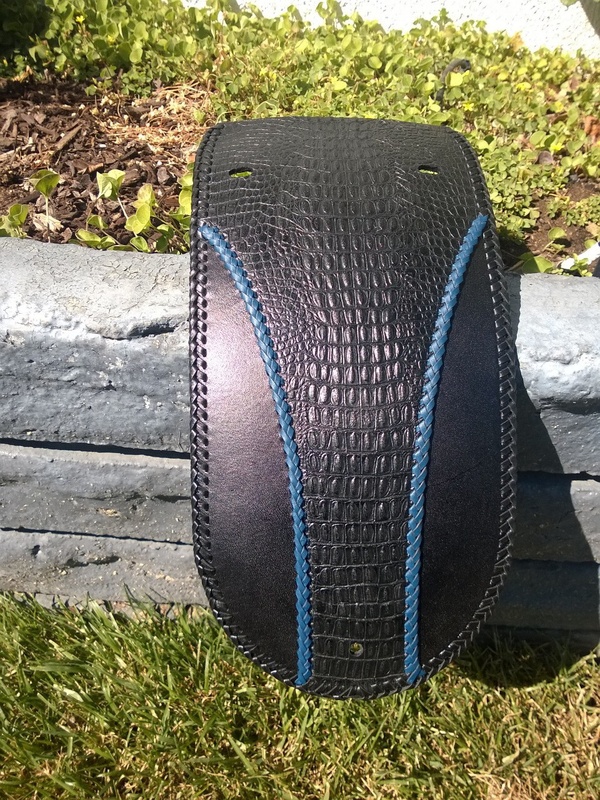 Harley rear fender bib with hand tooled Asian Water Dragon in Black antique with black edge lacing. 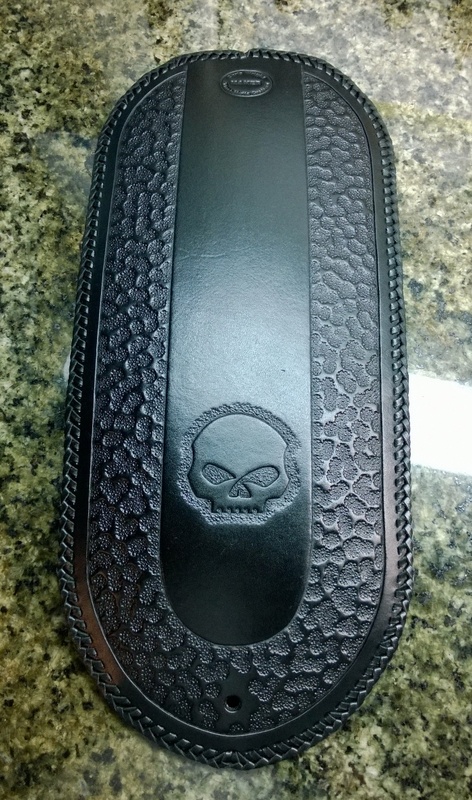 Harley rear fender bib with hand tooled Dueling Skulls in Black antique with black edge lacing. New bib in the Etsy shop! Hey folks, I have a new inventory piece ready to ship out to the first one that grabs it! I had some extra time last week so to keep idle hands from causing trouble I made up this Harley tank bib. It is available in the Etsy shop and is ready to ship next day. 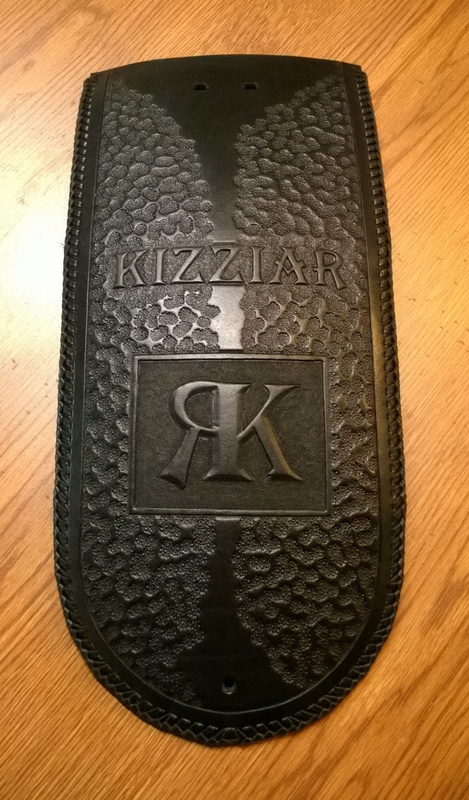 It is the usual high quality Herman Oak A grade saddlery leather with kangaroo edge lacing, both in black with the half-skull tooled into it. This tank panel fits all Road Kings, Softails, Fatboys and Dynas with the 5″ wide square bottom dash. The lower hole is punched to fit up to the late model tank bolts but it also has chrome eyelets and comes with 3′ of paracord to tie under the backbone for older models where the tank bolt location is different. $85 plus shipping takes this one home so it won’t last long! Here is a pic of the bib available and a couple of how this style bib looks on a few client bikes. Enjoy!